Kim earned a Bachelor of Science Degree in Speech Pathology and Audiology from Marquette University, as well as a Master of Science Degree in Communication Disorders from North Carolina Central University. She is licensed by the Board of Examiners for the state of North Carolina and is a member of the American Speech-Language-Hearing Association (ASHA). 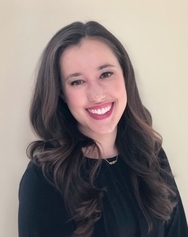 After completing graduate school, Kim began working in an elementary school and developed significant interests for working with Alternative and Augmentative Communication (AAC), as well as with children with various speech-language delays. Kim enjoys tailoring therapy sessions and meeting the specific needs of each child within their natural environment. She incorporates a team approach with her families to ensure confidence and skills within a child’s language and communication profile are enhanced to their full potential. She welcomes the opportunity to work with your child and family and is available to you for any questions you may have regarding your child’s growth and development. A resident of Durham, Kim enjoys volunteering at her church, playing guitar, exploring downtown Durham, hikes along the Eno River, and baking banana bread and shortbread cookies.